This October at Ashland Art Works is proud to showcase the beautiful work of two artists: John Weston’s fine woodworking with local and exotic, sustainably harvested hardwoods – and – Marcia O’Rourke’s “Celebration”, wall reliefs in earthenware & stoneware clay. Also featured is AAW’s newest member, ceramist, Marydee Bombick. Some of Ashland’s favorite artists have painted and signed 35 Step Stools to benefit 2 local charities. Step-Up to Help Out! 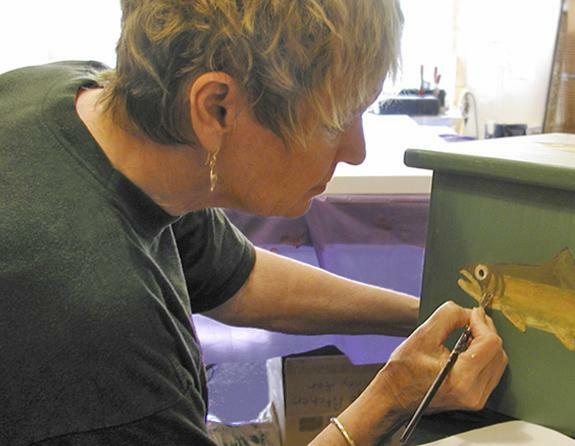 is Ashland Art Works’ Annual Fall Fundraising Event. 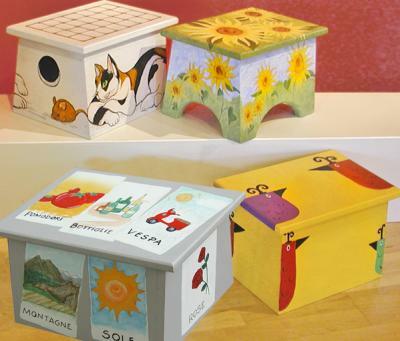 On sale are uniquely hand-painted Step Stools by local students and artists. Participating are students at the Ashland High, all three of the Ashland elementary schools, artists at Ashland Art Works, and other artists from the community. Once again AAW’s John Weston has coordinated this outstanding event. John and several of his woodworking friends built the 35 Step Stools that were then passed on to be painted. Visitors will be delighted by the imagination and creativity that has gone into each Step Stool. The sale of the Step Stools benefits two local charities: Maslow Project for Homeless Youth and the Jackson County Humane Society. The gallery is requesting a minimum donation of $50. per Step Stool. The Step Stools are being showcased First Friday, October 7 at Ashland Art Works: 291 Oak Street, Ashland. They will be available for sale at AAW until all are sold.